While window cleaning is often the most dreaded item on a Spring cleaning checklist, it’s certainly one that can make a big impact on the appearance of your facility. Fortunately, there are several ways that you can turn this task into a quick and easy process that produces effective and long-lasting results! 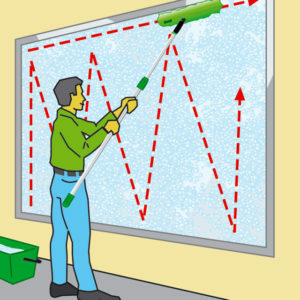 Review your squeegee technique. There are a number of resources out there that can provide a great refresher, even for the most seasoned professionals. One of our favorites is this series of infographics, which demonstrates proper window cleaning technique. Also be sure to check out the comprehensive window cleaning tutorial included at the end of this blog post. If your facility has multiple levels of windows, start at the top, then work your way down. It’s inevitable that dirty water from your t-bar and squeegee will drip. Follow this basic tip to ensure that you’re not erasing all of your hard work by dripping dirty water onto windows that you’ve already cleaned. If at all possible, try to schedule your window cleaning for a cloudy day. Too much direct sunlight (or heat) can dry your cleaning solution before you have time to properly clean your windows, which can leave unsightly residue. Invest in tools like an extension pole. In a perfect world, all windows would be placed in an easy-to-reach location, and be of reasonable dimensions. But our experience tells us that with most facilities, that’s rarely the case. To help make window cleaning a little easier (and much safer! ), consider investing in an extension pole. These handy tools come in many sizes, making them a generally inexpensive way to save time on this chore. Professional results require professional products. That’s why we carry a large selection of window washing tools and equipment from Unger, the leading manufacturer in the industry. Visit our online catalog to explore our product line, and discover how we can help you achieve a high-quality clean. Download and share helpful window cleaning infographics, courtesy of Unger!